'cause London is burning and I live by the river. 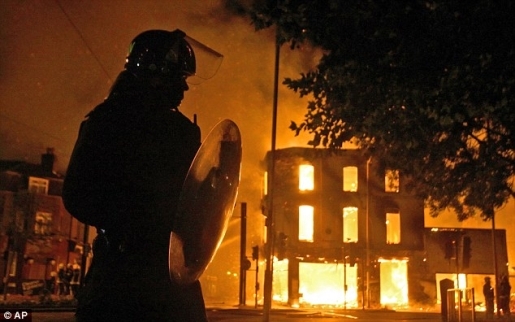 London is burning, and Joe Strummer is nowhere to be found. A fourth night of rioting has racked the streets of London, and groups of thugs are out breaking windows, burning things, and stealing electronics in an attempt to… well, basically, there’s no real reason here. They just want to take things and cause damage, first and foremost. While there are some gripes being aired, it is by people trying to excuse the inexcusable; you can’t complain about a lack of jobs, then burn down the only places of employment in the area. Here are some before-and-after shots of damaged and destroyed buildings in Tottenham, Brixton, and Enfield, three areas hit hard by the looting and violence. Meanwhile, Scotland Yard is increasingly distressed by its inability to curtail the violence, and faces intense criticism. There aren’t enough cops on the street, and those that are lack access to riot-quelling material like rubber bullets and water cannons. The solution seems to be neighborhoods banding together to chase off thugs and protect buildings. It’s always a good idea to use mobs to fight mobs. When it comes to a situation like this, I only feel bad for one group of people. Shop owners are getting the short shrift, usually by the communities they had been serving. What once was a business… someone’s livelihood… is now a burned-out shell. It’s bad enough that the rioters break in and steal everything not nailed down, but to burn the place on the way out is just adding insult to injury, really.